I immediately discounted this as a aircraft because of the strobe lights. However, once it got closer I realized that it had 4 very bright lights and 3 of the strobes were flashing in a pattern. I have never seen an aircraft lights look like this so I stayed with the object. Around 1:53 – I turned to get a better view of the craft. The craft did not turn. Appears to be some sort of aircraft (not sure if man made or not) that may be mimicking an airplane since it has strobe lights. Normal behavior would be to ignore a flashing light in the sky as it’s a plane but if you saw a moving object with no flashing lights then that would certainly draw attention to itself. 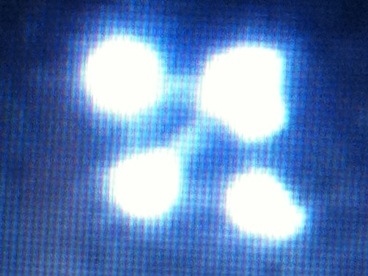 You can clearly see 4 very bright lights. Once you blow this video up you can see that the object is connected by some sort of dense frame structure connecting to the 4 corners. It also appears to connect through the middle of the craft from the front light to the back light. After altering the contrast etc I was able to determined from the video that the tail light flashes, then the left light flashes, followed by the front forward light. It does not appear that the right light flashes at all for some reason. Once it passed over me I turned towards the right with the goggles looking straight up. Once I did that the goggles became saturated with the bright lights and washed out the object prevented me from getting a sharp image and focus. The craft continued Northwest towards Eldridge and lost it behind the trees.